The German discount chains have been gaining ground in the last 12 months, as shoppers continue to keep a close watch on their grocery spend. BOTH ALDI AND Lidl have posted impressive growth over the past year, with the German discounters both gaining ground in the grocery sector. Tesco, which remains the largest player in terms of consumer spend, has shown a decline over the same 12 month period. Latest figures from consumer monitoring firm Kantar Worldpanel show that Aldi grew its share of the ‘multiples’ grocery market by 18.7 per cent in the 12-months leading up to the start of December this year. 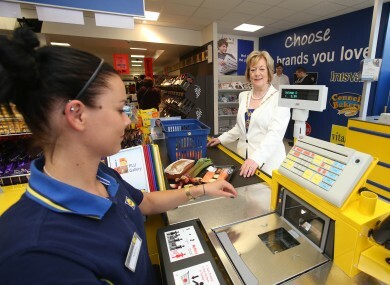 Lidl grew by 8.4 per cent — while Tesco, by contrast, saw its market share decrease by 6.4 per cent. Overall, however, Tesco still has the edge on its competitors in terms of size, at 26.1 per cent — followed by Dunnes (24.2 per cent) and Supervalu (19.5 per cent). Aldi’s share is 7.4 per cent, while Lidl are at 6.7 per cent; Superquinn have seen a slight drop in their share of the consumer take-home spend in the last 12 months, moving from 5.3 per cent to 5.1 per cent. According to David Berry, Kantar Worldpanel’s commercial director: “Value continues to be an attractive proposition for shoppers”. Despite the Central Statistics Office recently announcing that the economy grew by 1.5 per cent between July and September, the average household spend on grocery items has fallen by 0.2 per cent compared with last year. This is considerably below the 3.4 per cent price inflation as shoppers look to control their spend by reducing the amount of goods they buy. Multiples accounted for 88.9 per cent of the total ‘take-home’ grocery market, according to Kantar’s data. Email “Business booming for Aldi and Lidl as discounters show growth at expense of Tesco”. Feedback on “Business booming for Aldi and Lidl as discounters show growth at expense of Tesco”.